As the NFL owners and the Players Association continue to inch closer to finalizing the details of a new CBA (collective bargaining agreements), both sides remain optimistic that this whole mess can be resolved in enough time to avoid disruption of the start of summer training camps and the preseason NFL schedule. The real trick will be how well each team can get quickly up to speed in their preparations for the 2011 NFL regular season once the league reopens for business. Some of the more established teams will undoubtedly have a competitive advantage, but will this add value to their odds to win their division? The following is a look at the future odds for the four divisions in the AFC as provided by BetOnline. It’s little surprise that New England is a prohibitive favorite to win the East at -140 given that it has the reining league MVP Tom Brady as its quarterback and a head coach named Bill Belichick, who has won more games than any other active coach. However, there still has to be some concern with a defense that was ranked 25th overall and 30th against the pass last season. The New York Jets are the second favorite at +170. Rex Ryan has already guaranteed a win in Super Bowl XLVI, but he will still have to find a way to win the AFC Championship to get there. Maybe the third time will be a charm after two straight losses in the conference title game. Things really drop from here with Miami at +700 and Buffalo at +1800. The Dolphins still need to figure out if Chad Henne is their quarterback of the future or is there a veteran QB out there that can provide a quick fix. The Bills will be happy just to plug some holes on a team that was ranked 28th last year in both scoring and points allowed. This is shaping up as another two-team race with Pittsburgh and Baltimore co-favorites at +100. The Steelers are still loaded with the talent on both sides of the ball, but are set-up to take a step backwards this season as history has showed us what happens to teams the following season after losing the Super Bowl. The Ravens will have an opportunity to make a statement right from the start, given they host Pittsburgh on opening day. The pressure will be dialed-up this year on QB Joe Flacco, who has led his team to 32 regular season wins in three years, but has come up short in the playoffs each time. Cleveland is the third favorite at +700 and Cincinnati brings up the rear at +1500. The Browns may be a good play against their projected win total which should open around seven, but they are still a few years away from legitimately competing against the big boys in the division. If Bengals’ QB Carson Palmer stays true to his promise to retire if he is not traded, this team is already in serious contention to win the ‘Andrew Luck sweepstakes’ in next April’s draft. Indianapolis is a prohibitive favorite to win the South at -200, but that could be due more to perception than performance. Peyton Manning still has a lot left in the tank, but last season proved that the perennial all-Pro quarterback cannot get it done on his own. The Colts still need to fix a defense that was ranked 20th overall and 23rd in points allowed. Is this the season that Houston at +250 finally puts it all together for a complete 16-game schedule? The pieces remain in place on offense with QB Matt Schaub, WR Andre Johnson, and RB Arian Foster, who were all at or near the top of the league in their respective positions last season. If new defensive coordinator Wade Phillips can turn things around on that side of the ball, there could be tremendous value in the Texans’ odds, according to my NFL predictions. Tennessee is listed at +700 and Jacksonville is at +800 to round out the rest of the division. The Titans are one of those teams that could end up paying the price for the offseason lockout as they are dealing with a number of personnel issues, especially at quarterback. The Jaguars managed to win eight games last season with an offense that was ranked 27th in passing and a defense that was ranked 28th overall. It is highly doubtful that will happen again. San Diego is another prohibitive favorite to win its division at -225, but you have to ask yourself if last season’s 9-7 record was just an anomaly for this team or has its better years passed it by. The Chargers still have Philip Rivers at quarterback and a defense that was ranked first overall in the league last year, but there is still a chance that all those slow starts and playoff failures have finally caught up with them. The second favorite at +300 could be one of the best up-and-coming teams in the league. 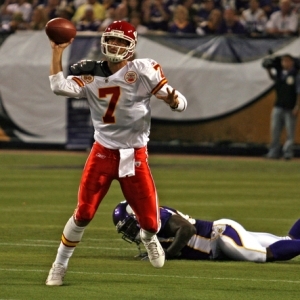 Kansas City had a breakthrough season in 2010 with a 10-6 record and AFC West title and appears poised to keep things headed in the right direction this year. Behind a bruising running game that was ranked first in the league last year along with a stingy defense, this is another team that oozing with value in its odds. Oakland at +500 is a team at the crossroads this season. Last year’s 8-8 record avoided a ninth straight losing season, but uncertainty at the quarterback position along with a defense that was ranked 20th in points allowed last year does not exactly paint a picture for bigger and better things this season. Denver is the longshot of the division at +1150 as it falls into the category of teams hurt by the lockout. The Broncos inability to come to a firm decision as to who will be their starting quarterback just adds to the list of problems with this team.